Hi everyone! My name's Max and I'm a lilac Tonkinese - a rather fine specimen too, even if I do say so myself! You'll meet me in the SHADOWS FROM THE PAST adventures and I hope you'll come along with me for the ride. By the way, being "lilac" doesn't make me a purple cat ... just in case you were wondering! Well, do I look purple to you?! Here's another photo of me. I am rather handsome, aren't I? This is the golden owl charm I wear on my collar. Its magic is rather special and, without it, I wouldn't be speaking to you right now! I bet you wish you had one too, don't you? In my opinion, owls and cats are a perfect combination - I'm sure you've heard of the famous poem which starts "The owl and the pussycat went to sea in a beautiful pea-green boat ..." Oh actually, now I think about it, I'm not too keen on boats and I really don't like the sea very much either - nasty wet stuff! Maybe owls and cats don't go together that well after all! Having said that, I'm extremely proud of my owl charm and don't know how I ever managed without it! I am so proud of this photograph - it's of my father and his name was Merlin. He was really handsome, wasn't he? When I was born, my pedigree name was Father's Image because I look so like him - I obviously inherited his good looks! My mother was called Sabrina, but sadly I don't have a picture of her; I do remember her being very dainty and pretty though. I have a new little cousin - his name is Monty and he is a blue Tonkinese, not lilac like myself ... and no, he's not blue as in royal blue, sky blue or even navy blue - in the same way that I'm not purple!! I can tell that he's going to grow up to be rather handsome though, which is only to be expected seeing as he's related to me! My birthday is on the 14th of August which means that I was born under the star sign of Leo the lion. That's rather appropriate, don't you think? Here's a picture of me on holiday, enjoying some much-needed rest and relaxation. By the way, if you're worried about my choice of reading material, there's no need - I never catch birds, but I do like looking at them! I am delighted that someone requested an interview with me (about time too!). Fame and stardom are surely beckoning ... would anyone like my autograph? First and most importantly, Max, what is your favourite food? Did you have any difficulties with food on your travels with your humans? What was the worst thing you had to eat? I do enjoy my food, I must admit, and my absolute favourite is roast chicken or ham. Whilst on our travels, I found some of the food we were given rather strange and there certainly didn’t seem to be any cat food on offer. I think the worst thing I had was when we went to ancient Egypt, where they gave me mashed-up beans and bread for my breakfast … ugh! People reading this may not know much about you yet. What is your background and your home? 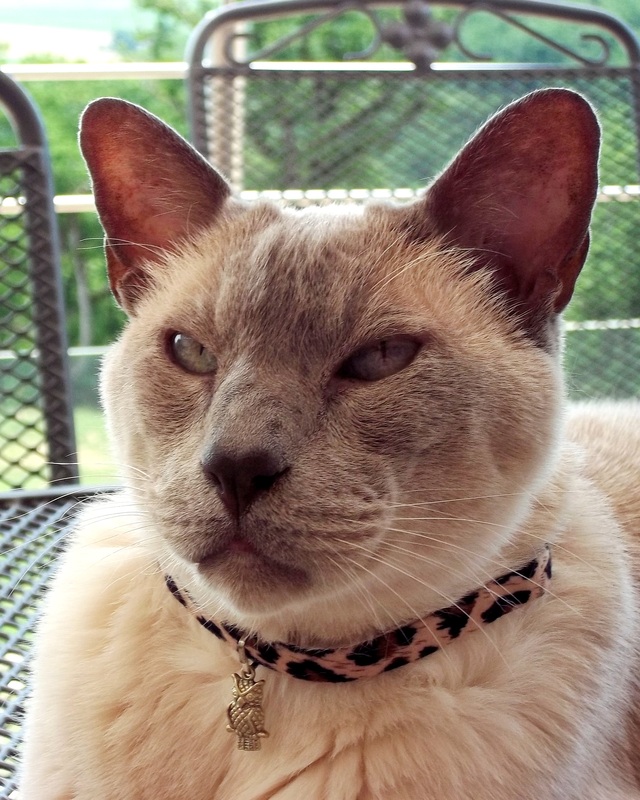 Well, as you may already know, I’m a lilac-point Tonkinese, a bit of an aristocat with a long pedigree! My father was called Merlin and my mother’s name was Sabrina Fayre. I’m the spitting image of my father and have a photo to prove it. He was very handsome, so I obviously take after him! When I was 13 weeks old, the Lancelot family came to see the lady who bred me, looking for a kitten to buy and they chose me – well, who wouldn’t? Although I belong to the whole family, I’m really Jemima’s cat – we have a special bond, you see. And since the disappearance of their parents, when the twins and I moved to live with their Uncle Richard, Jemima and I have become even closer. I’ve always been able to understand everything people said to me. I even tried to answer them and Mum (Jemima’s mum) was sure I was trying to speak – I did wonder if maybe humans were just too dim to understand. I found out from a cat I met in ancient Egypt that many cats are able to understand human speech, but it’s probably only cats of royal descent that truly have the power to do so. I was rather pleased to hear that – it means I must have royal blood running in my veins. I’m sure you do. It goes without saying, really. How do you see your role in life? Did you have any training for this role? I have to say that my role is to keep an eye on the children – Joe and Jemima, and their friend Charlie. They get themselves into some really sticky situations and I dread to think what might happen to them without my help. Unfortunately no one warned me that I’d be doing this sort of thing when I grew up, so I was totally unprepared for such a responsibility – I just have to improvise when danger looms, but I don’t think I’ve done too badly so far. What a good job I’m such an intelligent and resourceful cat! I’ve only read about your trip to Atlantis and to the Minotaur, and many of our readers will not have read either. Without giving too much away, what was your favourite historical place of all the places your author has written about so far? As long as you promise not to tell anyone else, Jemima, I’ll let you in to a little secret – I’ve been absolutely terrified on each one of our journeys so far. We always seem to find ourselves in such dangerous places; wars, monsters, tidal waves, volcanoes … you name it, we’ve been there, and I’m starting to worry about how many of my nine lives I’ve used up in the process. If I had to choose one place though, it would probably be Atlantis, at the beginning of all our adventures. It wouldn’t be for any of the reasons most of you out there might think – I know that many people would like to have seen the famous city before it disappeared forever. No, for me the reason is much more personal; I met the love of my life in Atlantis. Although, I’ll probably never see her again, I’ll never forget my beloved Mia, the dear little cat I rescued from the Temple of Poseidon. We were lucky enough to meet up again on my second trip into the past, but that was the last time I saw her. However, I do have a photo to remember her by, but that’s another story. That’s so romantic. I’m sorry you won’t meet her again, though. Tell me, though, with all this excitement, what would you pick out as the most exciting thing you’ve done in your life? What was your most embarrassing moment? Probably the most exciting thing I’ve done was to steal the famous sword Excalibur from a Saxon warlord, so I could give it to King Arthur. How many other cats could claim to have done that, eh? Er, well, actually one other cat, I suppose … you see I had a bit of help from a rather brave black cat called Midnight. If you want to know how we did it, you’ll just have to read The Shadow of Camelot! I’ve had more than a few embarrassing incidents, for example I didn’t like it when I had to be disguised as a baby during our trip to Atlantis – that was really undignified. But I think my most embarrassing moment happened when I first met the famous Boy-King Tutankhamun at his palace in ancient Egypt. I ran off screaming when I saw him, because I thought he was a mummy. It wasn’t my fault though. His legs were wrapped in bandages, following an unfortunate encounter with a crocodile and, from where I was standing, that was all I could see. Easy mistake to make! Jemima was pretty cross with me for behaving like that in front of a Pharaoh. Well, it was totally understandable, though. Most people would surely have done the same. All things considered, though, what would you most like to change in your life? I’d really like to find Mum and Dad, the twins’ missing parents. They’re trapped somewhere in the past and can’t find their way home. In fact, I wish I could have stopped them disappearing in the first place. You see, I was there when it happened and saw everything, but at that time I couldn’t say anything. And now we keep having to travel back in time looking for them and some of the places we’ve been to have been very scary. I’m always worried that we might not make it home either, so I just want our search to be over, once and for all. Also, the twins really miss their parents and are sad without them – I’d like to make them happy again. That’s very loyal and noble of you. I suppose it should be expected though, given your pedigree. But what if you were in a life-or-death situation – who would you most like to be with then? It would have to be Jemima. I love her so much and I know she loves me too – I hate it when we’re apart. If it came to a life-or-death situation, I know she’d do anything to save me and I would do the same for her. Although, thinking about it, I’d like the two boys, Joe and Charlie, to be there too. I’m very fond of them both, despite the fact that Joe teases me constantly. We make a good team, the four of us. We’ve already had one or two narrow escapes during our adventures so far, but luckily we’ve managed to get away in one piece every time … I hope it stays that way. And finally, if you weren’t you, who would you like to be? That’s a really hard question! I had thought that I might like to be a lion. They’re very noble creatures and people are always saying I look a bit like a lion, you know … but, on reflection, I think I’d like to be Puss in Boots from the Shrek movies. I’d probably look quite dashing in those leather boots, don’t you think?! I do indeed Max. It’s been a pleasure talking to you. Thank you for interviewing me, Jemima. I’ve really enjoyed answering all your questions. And, by the way, I think you and I could become good friends – anyone called Jemima just has to be my sort of person! Dear Max, I just loved your interview and you are just as brave and intelligent and really as insightful as I imagined. I am really enjoying reading the adventures and I can’t wait to read about you and King Arthur. I also love the Athena charm on your collar. I wonder how many humans know that you can talk to the twins and Charlie because of it. Good luck on your forthcoming adventures. I’ll be rooting for you all the way. Dear Fiona, I’m very pleased to hear you enjoyed my interview. Although modesty may not be my strongest point, I’m very flattered that you describe me as brave and intelligent (I’m not too sure about the “brave” part though). I’m very lucky to have that magic owl charm on my collar, which allows me to talk, but I’m not supposed to do it in front of grown-ups … so don’t tell anyone, will you? I have plenty more adventures still to come and I’m glad that you’ll be joining me. They say that bravery is about carrying on when you are afraid, Max, it isn’t about not feeling scared. You’re definitely brave! Hello Jemima! (It seems rather strange saying that to someone who isn’t MY Jemima, but I think you must be very nice seeing as you share her name.) Thank you so much for my lovely interview – it made me feel like a celebrity! Actually, I probably am famous, now I come to think about it. Would you like my autograph? Of course you’re famous Max, and will be more so as more people read about you, Jemima, Joe and Charlie. It does feel strange sharing a name with your Jemima – I keep thinking the books are talking about me! Oh Max – you are so charming! I have a feeling you would be able to teach my cat Flame a few things about acting appropriately. He is quite the opposite of you – he will jump first, ask questions later. I wish he was a bit more sensible and thought through where danger may lie unanticipated. I’m sure he has far fewer lives than you remaining! Thank you so much for your wonderful interview with Max, Jemima – I feel I know him better now! Thanks for taking part in The Shadow of Atlantis Blog Tour. He’s quite a cat, isn’t he? "I love Max the cat. In fact, when I first saw him on the front cover I was immediately drawn to the book. He looks like he is going to say something clever any moment." All I can say is that DinoMama is obviously very perceptive and has impeccable taste! I enjoyed being interviewed by Jemima Pett so much that I decided to give it a go myself and I'm interviewing a very brave little dog called Champ ... yes, I did say "dog"! Now I know, as a rule, I wouldn't dream of speaking to a dog, but I'm making an exception in Champ's case as he's a very special character indeed. You can find out all about him on my Max meets Champ page. Please take a look, as he's a real inspiration.